But Manly said that barely touches the scope of the abuse at the school, which has more than 19,000 undergraduate students and 45,000 students total. "He'd been doing this for 30 years so the numbers could be staggering," he told NBC News, adding that many of Tyndall's patients had little if any experience with a gynecologist and had no idea that what he was doing was allegedly inappropriate. USC said this week it has received 200 calls on a hotline it set up to handle complaints from former patients, 50 of them anonymous. And Manly said his phone "has been ringing and ringing." The lawsuit filed by Manly alleges that Tyndall groped, leered at and made inappropriate remarks to the women, performing procedures "for no legitimate medical purpose and for no other reason than to satisfy his own prurient sexual desires." One woman said she was molested eight times between 2004 and 2007. Another said she was abused three times between 2008 to 2014, always with a chaperone in the exam room who did nothing, and complained about Tyndall to a member of the school's medical staff in 2015. A third said her exam was so painful she begged Tyndall to stop it, while the fourth said he grazed his ungloved hands all over naked body. The second lawsuit, filed by attorney David Ring on behalf of a woman identified as J.C., alleges that Tyndall made inappropriate comments while inserting his fingers in her. In the sixth suit, Lucy Chi alleges Tyndall behaved in a "suggestive manner" and used non-standards techniques during the exam. In interviews with the Los Angeles Times, Tyndall said his exams were thorough but medically sound and that his only goal was to "protect the health of Trojan women." NBC News could not reach Tyndall for comment on Monday. Both complaints allege that USC deliberately tried to conceal Tyndall's history, but USC Provost Michael Quick said a statement Monday that's not true. "It is true that our system failed, but it is important that you know that this claim of a cover-up is patently false. We would never knowingly put students in harm's way," he said. 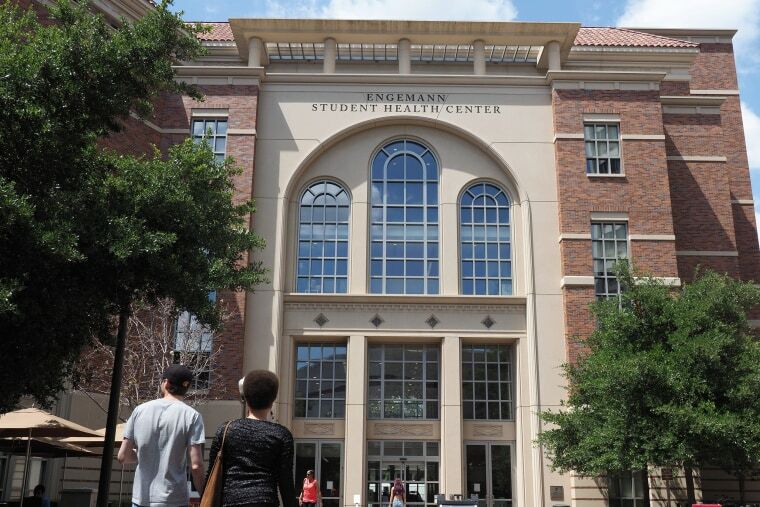 USC has said the director of the campus health center, who has since died, decided to independently investigate earlier complaints against Tyndall, including one from a student who said he "gave me the skeevies." USC officials contend that university leadership was unaware of those complaints. However, it did investigate Tyndall in 2013 after complaints about racial comments — the probe revealed that some students found him "creepy" — and then again in 2016 when a staff member reported sexual comments to patients. The university said it began termination proceedings against Tyndall in 2017, but he fought back by threatening a lawsuit that would claim he was being retaliated against for complaints about the health center and discriminated against for his age and gender. "Rather than engage in protracted litigation, the university entered into a separation agreement with Dr. Tyndall in order to sever ties with him immediately," USC said in a statement. Manly said USC is now in damage control mode. "If there wasn't a cover-up, why did you pay him a bunch of money in a settlement?" the attorney said. "The denial has already started." Manly sees parallels between the USC matter and the case of Larry Nassar, who was accused of molesting 332 girls and women, including Michigan State students, and is now serving an effective life sentence. The Tyndall accusations also hit close to home because Manly is a USC graduate. "It makes me sick to my stomach," he said, urging the university president to resign and the board of trustees to acknowledge the school's responsibility. "The board needs to look at these women not as adversaries, but as members of the USC family who have been greatly wronged." Hayley Walker and Andrew Blankstein contributed.